Thad Bonduris is a talented performer, a guitarist who plays professionally with a number of bands in a broad range of styles. Thad has brought together like-minded musicians to instruct at his music studio where students of all ages can learn any instrument and any style of music. 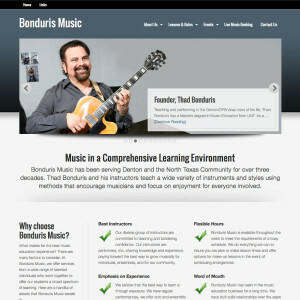 Websentia Web Services created this website for Bonduris Music using Wordpress and the Genesis platform from Studio Press. The theme used is Optimal, a theme offered by AppFinite. AppFinite, operated by Wes Straham, is a Genesis Community Developer, one of many third party developers who add their talent to the Genesis core of child themes. Here the Optimal Theme is deployed without any major design changes and demonstrates the flexibility in configuration and display that Genesis-based themes offer. The website for Bonduris Music communicates in a glance, an intriguing display of the many facets of music services that Bonduris Music offers, enabling students and professionals to pursue their musical dreams. 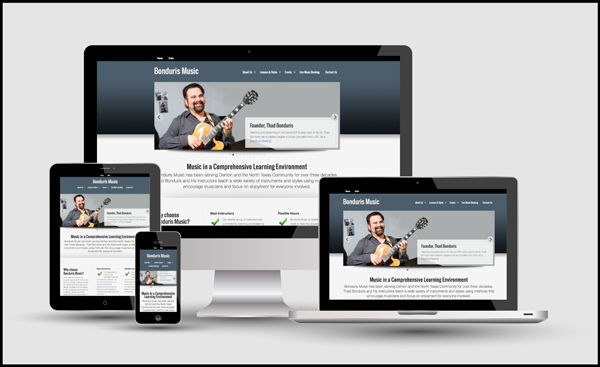 Working for Bonduris Music, Websentia Web Services installed Wordpress with the Optimal theme and crafted the majority of copy and images. Websentia also hosts this site with a full range of hosting, email, and optimization services.